Wow. 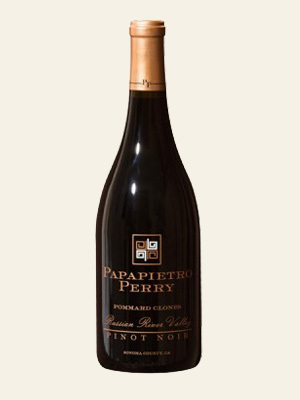 This bottling shows why the Pommard clone is used as the base of so many great Pinot Noir blends. And we have the luxury of picking grapes from some of the best vineyards in the region for this blend. The wine starts with an intoxicating fruit nose wrapped in heady caramel, vanilla and toasted oak. The wine really delivers on the palate, with generous fruit, expansive mouthfeel and impressive depth and length. The expressive flavors cover the red to purple fruit spectrum: vibrant Bing cherry, raspberry, fresh plum and blackberry fruit delivered in an inviting toasty oak frame. This is a satisfying mouthful of wine—lush and fleshy but with equal mouthwatering acidity. Enjoy solo or bring on the steak or rack of lamb. We’re still doing it! Not many California winemakers produce single-clone wines, and this one consistently shines as one of the best wines we produce. Our Pommard Clones, which was the first clone growing in the Russian River Valley, release comes from a variety of vineyards in the Russian River Valley, including Leras Family Vineyards off Woolsey Road, Bucher Vineyards on Westside Road and Peters Vineyard just outside of Sebastopol, and they are always special. Each has the great characteristics of the Pommard Clone; deep flavors with rich mouth feel, and vibrant flavors unique to each site. While at first blending them was an experiment, we were so pleased with the results that we hand select the best barrels each year from each lot and bottle them. We have carefully refined our winemaking techniques in a way that defines our unique Pinot Noirs, separating the grapes by clone and vineyard during fermentation and aging. This gives us many more blending options. We cold soak the grapes two to three days before adding several different types of yeast, cultured specifically for Pinot Noir. During the seven to twelve days it takes to ferment, we hand-punch each fermenter, up to four times a day to ensure that the temperature doesn’t get too warm. Once the juice is fermented, we press the fruit and move the wine into Francois Fréres French oak barrels, and then age for at least 11 months before bottling.